When I woke on March 15 to an ice cold apartment, I knew this wasn’t going to be a wonderful day. Fleeing downtown, my suspicions were confirmed by the sight of life size polar bears in the middle of the glass cupola that is the Pacific Centre Mall’s entry on Georgia Street. Not only that, there were several handsome young people in red uniforms, asking if you wouldn’t like to help the poor polar bears. Well, who wouldn’t? Sign up here folks, you can feel good about yourself while you keep consuming, right here. Of course, this polar bear spectacle was the brainchild of Coca Cola, one of the world’s richest corporations, and they were being generous too: they had pledged two million dollars over a period of five years for the bears. What a gesture this is; it works out to about eleven hundred dollars a day, which for a billion dollar corporation serving 1.5 billion drinks a day, amounts to a minor accounting error. And further, Coke has partnered with the WWF. 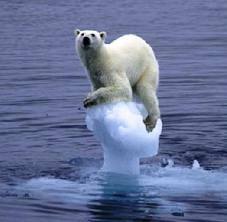 So now we can all relax, global climate change is being taken care of and there will always be Polar Bears for our children and grandchildren, right? Open happiness, indeed. I saw red in more ways than one and asked one of the innocent, gorgeous girls in red if she had ever actually thought about what she was doing. Was she just young and naive? Ignorant of the facts? Desperate for a job? I don’t know, and I don’t blame her. I do blame the large organizations that are exploiting a heartbreaking, serious environmental problem for pushing product. And that the WWF is partnering in this deplorable spectacle proves that corporate cynicism can find a home even in a squeaky clean environmental organization and a city that prides itself on being green and environmentally aware and awake. Shame on all who aided and abetted in this demonstration of all that’s wrong with our corporate, deeply corrupted culture. I always enjoy your perspective, just wish they were longer and written without regard to social constraints. I usually ask those well meaning clip-board clasping young people the same thing, “Do you really know what it is your supporting?” It is a shame to see people giving time to causes that support the very problems they believe they are solving. eg.The annual cancer run is a mass demonstration of this.